Vaginal delivery simulation training can have a positive influence on more than the confidence of novice trainees in obstetrics. Simulation training in routine labor and delivery procedures can also help to reduce maternal morbidity and maternal mortality. The prevailing literature firmly supports simulation training as a viable means to improve patient management skills associated with normal maternal interventions and urgent obstetrical situations (such as shoulder dystocia, eclampsia, and obstetrical hemorrhage). This article explores a recent study detailing the effectiveness of exposing novice labor and delivery trainees to the procedures involved in vaginal delivery through simulation-based medical education. * The purpose of the study was to assess the benefit of such training in terms of how it impacted outcomes and clinical preparedness. Could simulation be effective in solidifying the skills needed to make vaginal delivery as safe as possible? 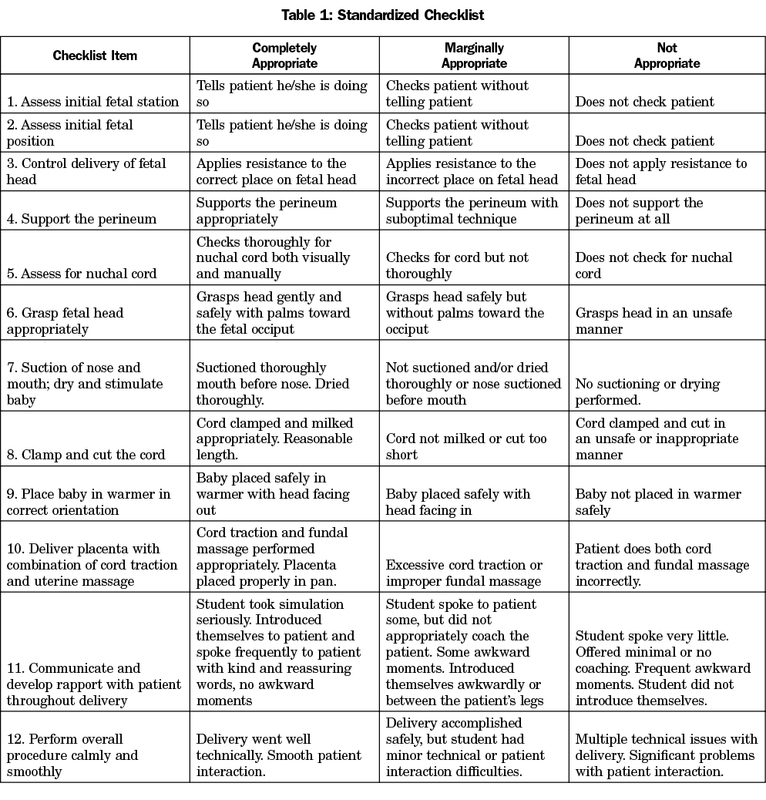 Following initial didactic instruction on delivery basics (including lectures on pelvic anatomy, labor, and routine vaginal delivery maneuvers), third-year medical students who had performed a simulated vaginal delivery on a birthing manikin received exams which were scored using a standardized checklist (shown here). After correcting for multiple comparisons, the results indicated that students who were assessed in simulated vaginal delivery were "better prepared for their initial real-life vaginal deliveries," confirming that simulation training can be a satisfactory and effective way to improve performance and benefit patient safety. Get Patient Safety Awareness Week Updates! In the classic sense, clinical obstetrics training involves hours upon hours of learning within real-life, clinical settings. To help ensure that clinicians, labor and delivery teams, and all others who are part of the maternal healthcare team are suitablly prepared to manage unforeseen events and potential complications, OB/GYN trainees are expected to undergo extensive training in vaginal deliveries for the sake of patient safety. Students trained on a manikin-based maternity simulator (and whose training includes team communication development and critical thinking exercises) tend to demonstrate increased mastery and more confidence in routine deliveries. These learners go on to successfully transfer self-assessed competencies into actual clinical experiences. Simulation training in vaginal delivery offers obstetrical students a safer and risk-free environment in which to obtain practical experience in labor and delivery. Enhanced patient safety and enhanced learning are significant benefits of realistic simulation training. Obstetric simulation holds great promise as a vehicle to foster comfort, confidence and proficiency with childbirth procedures. Learners can enter their professions with a higher degree of clinical competency and the skills needed to help improve patient safety and reduce incidences of maternal morbidity. CAE Lucina is the only wireless birthing mannequin with validated, integrated maternal-fetal physiology and interchangeable static cervices. Lucina does it all to ensure learners achieve critical training objectives. A simulator like CAE Lucina can benefit traditional lectures and training experiences of maternity learners by improving their knowledge and skills retention long after their simulation training is concluded. Inscrivez-vous pour recevoir les renseignements les plus récents sur les produits, des offres spéciales, des tutoriels, des renseignements sur les produits et bien plus! Cliquez ici si vous souhaitez qu’un de nos représentants communique avec vous!